In a multi agency pitch, WOW! Design won the mandate to revamp the Rs. 2000 Cr. FMCG brand, on the sheer basis of the best Design Strategy proposed and in-depth consumer understanding. The Brand is a perfect example of how you don’t always need big celebrity endorsements to build a brand. Its really interesting to see how Ghari Detergent, a Kanpur based brand with low advertising and promotional activities managed to defeat brands such as Tide and Nirma. There’s only Hindustan Unilever Ltd’s (HUL’s) Wheel detergent that’s ahead of Ghari, with estimated sales of Rs 2,500 crore. As of December 2010, Ghari had almost doubled its market share, taking it up to 13.5% in the Rs 12,000-crore detergents segment. Wheel still leads with over 17%, but the gap is slowly but surely narrowing. The one line brief was to give the Ghari Brand a total makeover. There was no clear vision as to how much or how little the brand should change. Ghari targets housewives in small town and villages, who are extremely value conscious buyers and willing to switch brands. The only USP is the Value for Money proposition. Hence the brand must remain approachable for the consumers. For a brand which operates in the economy zone and yet clocks sales of over Rs.2,000Cr. its very much a volume game and hence any drastic change in the brand can be fatal. More so because it’s a brands for the lower SECs, who might not welcome their brand going for a complete relook, overnight. Also in the market in which it operates there is also the risk of the new brand look being thought as counterfeit. Hence WOW! Design strongly proposed a very subtle change in the Brand Design which just crosses the threshold of consumer’s ability to spot a change in the Brand. First and foremost the Brand Logo was tweaked. A bevel effect was rendered to it along with a modern look. The Font and Colours were retained. However the black colour was eliminated to simplify the logo. The fact that Ghari is a detergent brand was reinforced by bringing the words ‘Deteregent Powder’ close to the logo and giving it the logo colours thus forming a tight lockup. 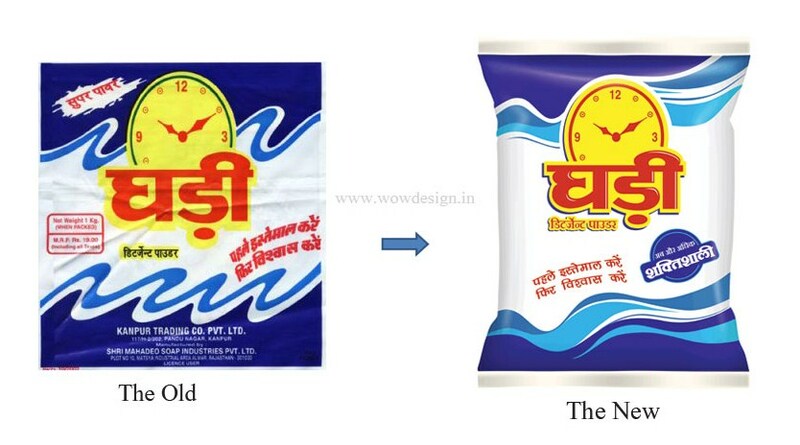 The biggest challenge was to revamp the packaging of Ghari detergent and yet retain most of the existing design elements. When you are dealing with such huge volumes you can’t take the risk of changing your brand completely overnight and lose out on the loyalists. It’s the only pack among the top selling detergents in India which has a predominantly white pack. Most competitors are either Blue or Yellow. Research showed that the housewives recognized the Brand by the White and Blue packaging. WOW! Design believed that Ghari should leverage this unique property. A dipstick research conducted with the existing Ghari pack, showed that the consumer did recognize the blue wave on the pack however they were not happy with the rendition of the same. 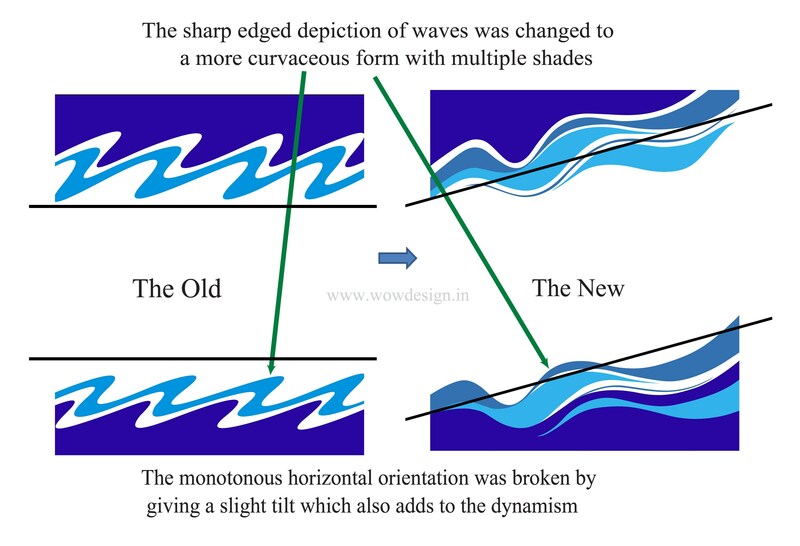 The Wave was given a more life-like rendition, without those sharp edges in the existing pack. The same was created by interspersing bands of different shades. The existing pack has the wave running horizontally. The same was given a little tilt adding more action to the pack; afterall a wave is supposed to be more dynamic and full of energy. The outcome was a new refreshed look for the Brand, yet not losing out on the familiarity in the minds of the consumer. A perfect example of where ‘Less is More’. Very good, concise and well projected information. However, A few more statistical information under result section would have helped better. But thank you very much for posting this.